So Topshop have turned their minds to Autumn / Winter, and here are some of the highlights. Sweatshirts are still king, slipper shoes are still stylish (yay!) and the Gwenda court is still going strong, in a whole new range of colours. As ever, I've hunted out the cotton, silk, or leather options, eschewing the sea of polyester blah that threatens to engulf us. But if you look hard enough, there's plenty of the good stuff out there - seek and ye shall find. Silk colour block cami, £38; Leather fold over clutch, £38; Gwenda pointed courts, £58; Crepe tunic, £34; Silk wrap tee jumpsuit, £90. Long sleeve sweat, £18 and in navy (I was also drawn to the Raglan panel sweater, £55 but this post is already sweatshirt heavy); Leopard multi zip tote, £95; Knitted marble print top, £38. 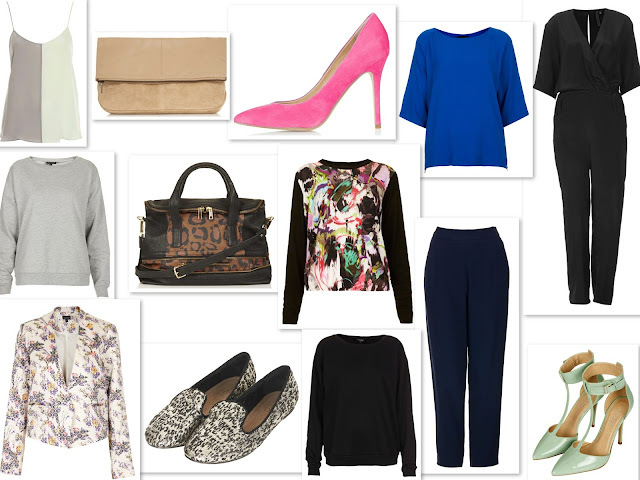 or in black suede; Supersoft sweater, £18; Silk crepe drop loose trousers by Boutique, £80; Goslin t-bar points, £68.